The wet spring and, so far, summer, in the Chicago area has been a mixed blessing for outdoor enthusiasts. Yes, the rainy weather has made it harder for hikers, mountain bikers and trail runners to enjoy the trails they love. But the higher water levels have given paddlers a much longer—and exciting—season, the landscape couldn’t be any greener, and hikers have a better opportunity to track down waterfalls in Illinois. Waterfalls? In the Prairie State. Yes, Illinois may be the second flattest state in the union behind only Florida, but there are several waterfalls worth exploring. You just have to know where, and when, to find them. Don’t expect a massive, in-your-face experience like Niagara Falls or those out west. In Illinois, waterfalls tend to be small and seasonal, with primetime coming after the winter melt before drying up in the summer. But this year’s extended season offers summer hikers the opportunity to see them in full force. Here are four destinations that offer an excellent chance to take all that lousy weather this year and put it to good use. Located on the Illinois River, Starved Rock has boating, fishing and picnicking aplenty, which draws lots of the big crowds. And the bluffs overlooking the river are popular spots for sightseeing. But if you want to explore the falls, you have to work a little bit—they're only accessible via hiking trails. Of the 18 canyons, 14 have waterfalls at various times of the year, the largest of which are Wildcat Canyon, LaSalle Canyon and St. Louis Canyon. While you must hike to get to them, all the trails are well maintained, busy, and easy to navigate. If you can make it during the week, do so to avoid the crowds. All the rain this season has closed several trails, and the visitor’s center parking lot has been underwater for nearly two weeks as of this writing. So be sure to call ahead or read the park’s hiking blog to find out conditions before making the drive out there. Once you arrive, you can use the map to plan a route to visit the canyons, or just explore on your own. The Wildcat Canyon, which features a 125-foot drop, is the largest in the park. It’s only about 1 mile via trail from the visitor’s center. LaSalle Canyon is about two miles from the visitor’s center, but worth the trip. The waterfalls are probably the most scenic in the park. If you’re looking to stay the night, the grand Starved Rock Lodge is on the National Register of Historic Places. Built by the Civilian Conservation Corps during the Depression, the lodge is worth a visit even if you aren’t spending the night. 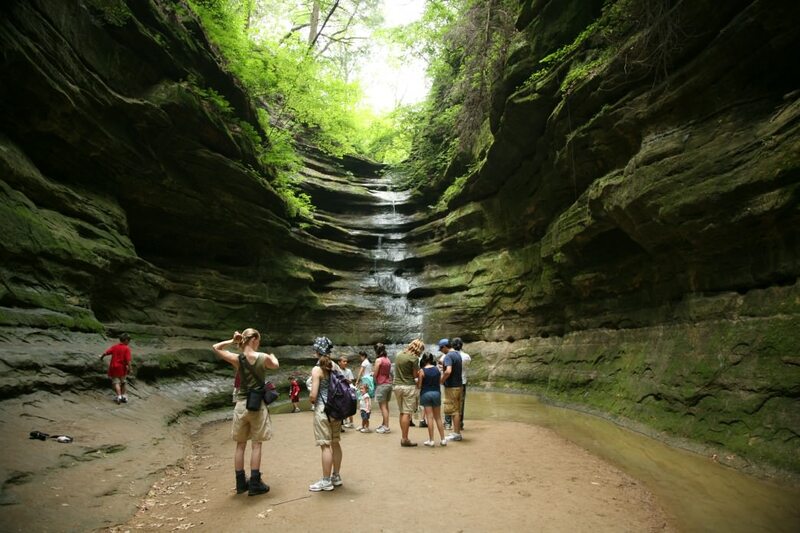 There’s a total of 3.2 miles of trails at Matthiessen, but you’ll find lots of parallel and intersecting trails, meaning that it doesn’t take too long to get to any one canyon. It’s a great destination if you’re hiking with kids and want the option of heading back to the car without a long hike back. In addition to Cascade, check out Giant’s Bathtub Falls and Lake Falls, which are both a short hike away. 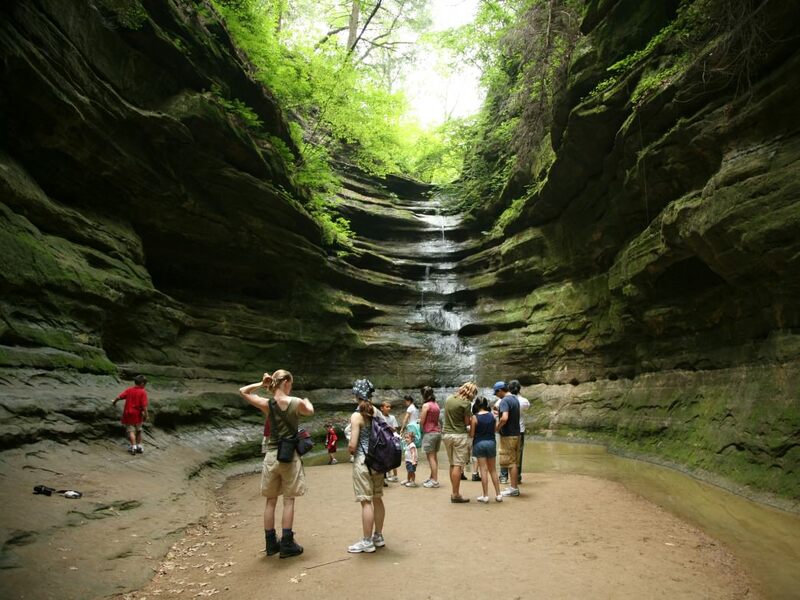 There’s no camping at Matthiessen, but you can camp at Starved Rock and make the short trip over in the morning. 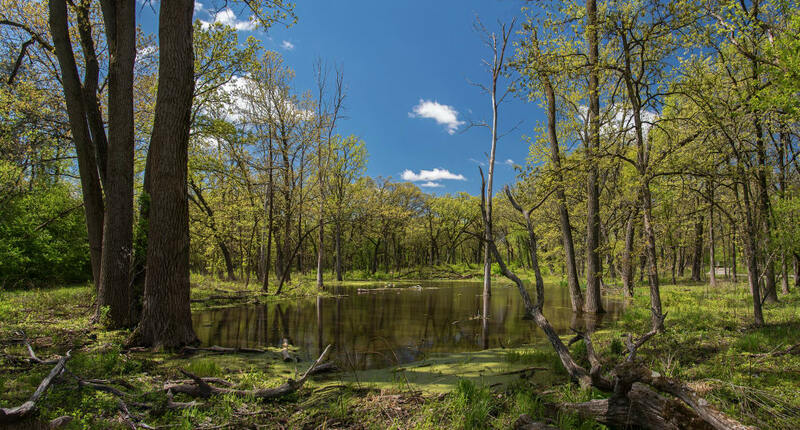 This forest preserve in DuPage County isn’t necessary a great escape like the rest of the destinations on the list. But it is a scenic and very useful trail system close to the city that’s a fine destination for cyclists, runners and hikers. And of course, there’s a waterfall, although it’s not the namesake you would expect. Located in Darien, Ill., Waterfall Glen is a 2,492-acre preserve that completely surrounds the Argonne National Laboratory. There is a 9.5-mile crushed limestone trail that loops around the entire property and is the main means of getting around the park. Several crushed-limestone spurs do exist, but the bulk of the trail system is the big loop. The ecological and geographical diversity is impressive, with prairie, savannah and oak-maple woodlands—plus lots and lots of hills. For hikers, your best bet is to start in the parking lot of Bluff Road, near the tiered waterfall created by the Civilian Conservation Corps in the 1930s. You can actually find some singletrack that’s great for hiking, and the waterfall, while small is certainly pleasant. Probably most striking, however, is that the falls didn’t give the preserve its name. It was actually named for Seymour “Bud” Waterfall, an early president of the forest preserve’s board of commissioners. And no, I’m not making that up. Ready for a real road trip? 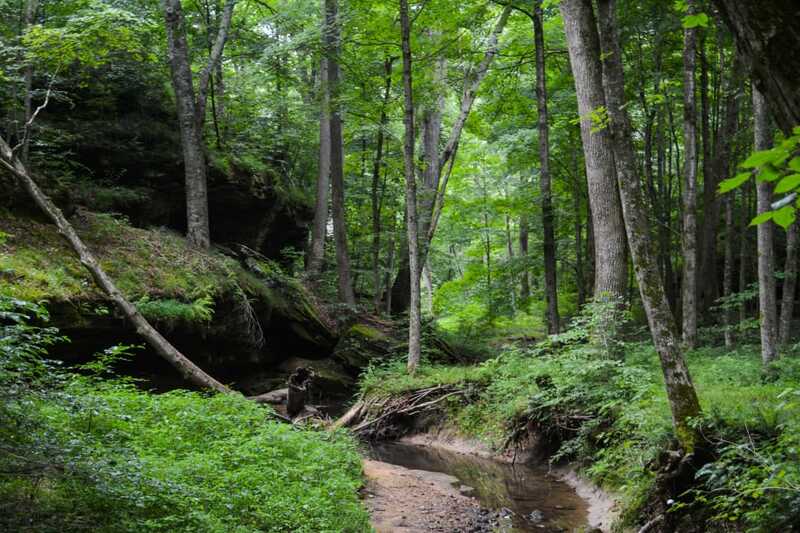 The Shawnee National Forest in far southern Illinois is a hiking destination that matches up with some of the best in the country. 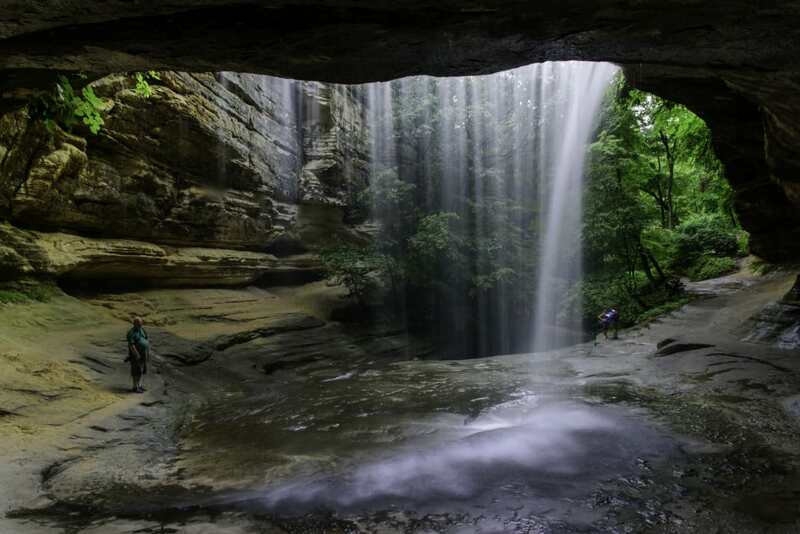 Taking up much of the southern tip of southern Illinois between the Ohio and Mississippi rivers, the Shawnee National Forest contains more than 280,000 acres and some of the most scenic views in the state. You’ll find a wide variety of terrain, including rock formations at the Little Grand Canyon and the Garden of the Gods that look more like something you’d find out west. There are five different recreation areas within the national forest—Bellsmith Springs, Garden of the Gods, Pounds Hollow, Lake Glendale and Johnson Creek, each of which offers a variety of activities from boating to hiking. Burden Falls in Pope County is one of the most scenic waterfalls in the forest, and considered the largest in the state. Hiking trails and camping opportunities abound in the area, and for serious hikers this should be a must-visit. You certainly won’t look at Illinois the same way again. Written by Jeff Banowetz for RootsRated.